[S11] John J. Weidner, Compiled Birth, Death, 240, 539, 587, 599, 612, 613, 615, 632, 678, 683. [S362] Platte Valley Kinseekers, Platte County Nebraska Marriages Book 5, 1893 - 1898, 43. [S363] Platte Valley Kinseekers, Platte County Nebraska Marriages Book 6, 1898 - 1902, 11. [S423] Adam Weidner, State of Illinois; Department of Public Health - Division of Vital Statistics; Certificate of Death. [S11] John J. Weidner, Compiled Birth, Death, 612 & 613 & 683 "of Bavaria." [S423] Adam Weidner, State of Illinois; Department of Public Health - Division of Vital Statistics; Certificate of Death, country only. [S534] 05 Jul 1860 1860 U. S. Census, Arlington Heights, Cook County, Illinois, USA, Wheeling Township, page 151, dwelling 1059, family 1020, 1860 census states he is 42 years old and born in Hanover. [S872] Mary Weidner, State of Illinois; Department of Public Health - Division of Vital Statistics; Standard Certificate of Death, Birth country. [S874] Pankratz Weidner, State of Illinois; Department of Public Health - Division of Vital Statistics; Standard Certificate of Death, Birth country. 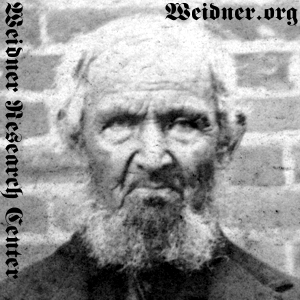 [S902] Jacob Weidner, Bark Clementine Microfilm, 02 Sep 1851, The ship passenger manifest indicates he was 33 years old at the time of the voyage suggesting he was born in 1818, 104. [S11] John J. Weidner, Compiled Birth, Death, 240, 612. [S8] Edwin Weidner, The Weidner History, 6, death year only. [S12] Cook County Herald, 13 May 1910, p. 8, col. 7. [S896] Unknown author, Church Records, 1853-1915, St. Mary Catholic Church, Buffalo Grove, Illinois, Film Number 1548218, Items 22-25, St. Mary, Buffalo Grove, Baptism 1855-1901, N.I., page 10. [S11] John J. Weidner, Compiled Birth, Death, 538. [S11] John J. Weidner, Compiled Birth, Death, 658. [S359] Platte Valley Kinseekers, Platte County Nebraska Marriages Book 2, 1881 - 1885, 39. [S11] John J. Weidner, Compiled Birth, Death, 539. [S11] John J. Weidner, Compiled Birth, Death, 678 Anton is underlined. [S11] John J. Weidner, Compiled Birth, Death, 632. [S11] John J. Weidner, Compiled Birth, Death, 587.